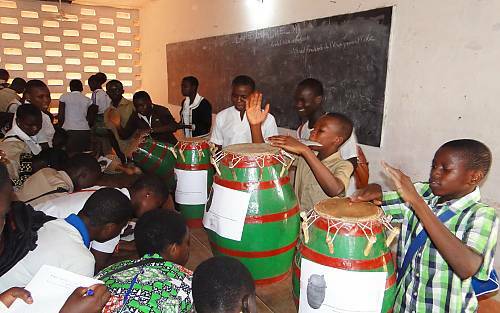 Six thousand young people from southern Togo were keen to discover the traditional musical instruments of their region. This was made possible thanks to a one-year project implemented by the National Commission for Cultural Heritage (CNPC) of Togo to safeguard this element of the intangible cultural heritage of the country. The project concluded with an exhibition organized from 14 to 28 January 2017 at the secondary school Lycée de Tsévié Ville I, in the capital of the maritime region. The educational activities conducted as part of this project enabled young people and teachers to reclaim the know-how and practices associated with these instruments. The objective of the project was to ensure the creation of a comprehensive inventory and to revitalize the chain of intergenerational transmission. As a result, through the inventory work carried out by five young people trained in community-based inventory, ninety-six different instruments and practices were documented with the participation of the communities and a directory was produced. In addition, fifty-five young community members were trained in the production of instruments by the practitioners themselves. During the training sessions, expert facilitators were able to transmit to the young participants not only the essential notions concerning the techniques for manufacturing the instruments but also the traditions and know-how related to these instruments, thereby stimulating the interest of the youngest individuals in the related rituals. Examples of instruments manufactured include the Atopani talking drum and the drums related to the Kinkan dance, as well as the work of the forge in Yohonou. Funded by the Intangible Cultural Heritage Fund established under the 2003 Convention, this project constitutes a pilot phase that could be extended to other territories in Togo.